As a couple who have a civil partnership, you can now convert this into a marriage. 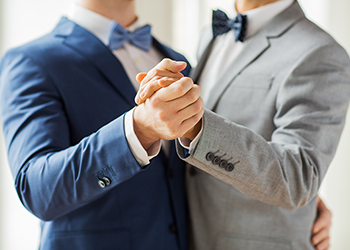 Before holding your celebration, you will need to sign a conversion into marriage declaration at your local register office. After which you can hold a marriage ceremony in any location that appeals to you. Make your day more memorable with a ceremony that is as unique as you are. 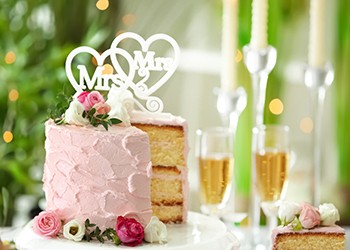 Let us help you create a wedding celebration that reflects your love for each other. Some couples want a formal style ceremony, others prefer something more informal and free flowing. As with a marriage celebration, once the legal part of the marriage conversion has taken place, the style of your ceremony service can be completely bespoke. So dream big or small, it’s your day! If your ideal is to get married at home or an intimate venue that is close to your heart surrounded by only a few close friends, there’s nothing stopping you. Or, if you want a cast of thousands and a marriage ceremony that would make the Beckham’s envious, bring it on! You can include your favourite music, a reading that has special meaning, religious content like a prayer or blessing, a symbolic action like lighting a candle and almost anything else you may desire to make your day perfect. We work with you to create your ceremony. Simply fill in the form on the Contact Me page or call Fiona on 0793 037 2036 and we will make arrangements to discuss your ceremony. Consultations by phone, Skype, Zoom or Facebook video messenger are included in your package. Meet ups in person may incur a charge. During our discussion, we will throw around ideas for your perfect ceremony and chat a bit about your story. I will gather all the most interesting details that make you and your partner such a perfect match, from this I can make your ceremony script truly personal. Once you have signed the booking form and paid the deposit, I will draft an order of service so that we all know how the ceremony will run. Two weeks before your event I will email a draft of your ceremony script for approval. I will be at your venue about an hour before your ceremony starts to settle any nerves you may have and to answer any last minute questions. If you wanted it, there is an option for us to meet up the day before the event to run through things. Following your ceremony you will receive a presentation copy of your script to keep as a memento of your day. I offer three packages for marriage ceremonies. I am happy to chat through these with you when we meet up. I can also source invitations, commemorative candles, balloons, ring cushions, guest books and other items to help you with your event. Prices for these are available upon request. This is a short service (about 20 minutes), traditional and simple in style. Creation and delivery of a unique ceremony script with a presentation copy of the words from your special day in a commemorative A4 folder. This is a lovely romantic service (about 30 minutes) with time to really personalise your ceremony through the telling of your love story and to celebrate your union by the signing of a marriage celebration certificate. Creation and delivery of a unique ceremony script, certificate and a presentation copy of the words from your special day in a commemorative A4 folder. This is a truly romantic service (about 45 minutes) with plenty of time to make the ceremony really unique; celebrating your vows in style, with the option to include a symbolic act to illustrate your joining in marriage. Your love story is also told as part of the ceremony and to commemorate the day with the signing of a marriage celebration certificate. Creation and delivery of a unique ceremony script, commemorative certificate in a presentation box, copy of the words from your special day in a commemorative A4 folder. The freedom to add anything else to make your ceremony ‘extra special’, release of butterflies for instance at the end of the ceremony. Once booked, ceremony dates can be changed subject to date availability but all deposits paid are non-refundable. A 50% deposit is required on booking. A rehearsal the day before the event is charged at £60. Additional mileage may be charged if the venue is more than a 50 mile round trip from Hambleton (North Yorkshire). Overnight accommodation may be charged if venue is more than 150 miles from Hambleton, or an early morning or late evening ceremony is required, or a rehearsal is requested the day before. Please note that music to be played during the ceremony is not included. Music can be supplied on request but may incur additional fees. Additional certificates can be purchased at £5 each. Please note that the fee does not include the cost of any materials such as candles or other items requested for the symbolic act(s). These can be sourced for you and will be charged at cost + 20%. The fee does not include any additional cost incurred in making your ceremony ‘extra special’ eg personal appearance by a celebrity, a battalion of Stormtroopers or a cameo by Stan Lee. A copy of our full terms and conditions will be provided as part of the booking process.